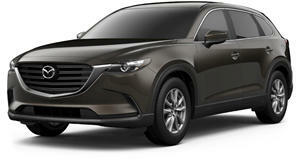 First images of the refreshed 2013 Mazda CX-9 revealed ahead of its live debut in Australia. These are the first images of the 2013 CX-9 model that Mazda will debut in October at the Australian Motor Show. Recent rumors suggest the Japanese automaker may also bring the large crossover to the Paris Motor Show next week to gauge public opinion of the new front-end design before sending them out to showrooms at the end of the year. Following the refresh in 2010, this is the CX-9&apos;s second facelift since its initial introduction in 2007, adapting the KODO design language to a three-row crossover. While it was at it, Mazda also added new safety features including Lane Departure Warning, Forward Obstruction Warning and High Beam Control, and will offer the car with an updated stereo system and revised navigation and speech-recognition systems. The 2013 Mazda CX-9 will be launched with an MZI 3.7-liter V6 mated to a six-speed automatic transmission.